I was somewhat surprised one Saturday to receive apologies for the absence of one of the regulars when I arrived for my weekly chess club at HMP Bristol. “He says he’s very sorry he can’t make it today,” said the guard, “but his sister is visiting.” Don’t get me wrong: it is of course good manners to excuse non-attendance but, after all, it was only a leisurely, drop-in, voluntary chess club session. I never even made any assumptions who would be there and who wouldn’t, much less expected regular participation. This must have shown in my face as Chris looked at me and said, “You know, it’s a big deal for them. Most men have told their families not to visit on Saturdays because they’ve got chess. He’d never miss it if his sister wasn’t flying back home to the States tomorrow.” I’m sure you can imagine how much of a testament to our little chess club that was. Weekends are naturally more convenient for families to schedule visits, with no work or school to arrange around. Weekday visits are not only trickier to schedule, but they also carry higher cancellation risk. But Saturday is chess day. Theoretically, chess can have huge benefits in a prison – intellectual rigour, channelling aggression, positive attention focusing, cheap and inclusive, teaches social rules, decision making, logical thinking. If the above looks strangely familiar to every single reader, that’s the point: our pitch to prisons can pretty much be a carbon copy of our pitch to primary schools that we all know so well. The bottom line is that many many prisoners are there precisely because of their unfortunate inability to make sensible decisions, either through not thinking before making one or through mis-evaluating potential outcomes. Thanks to CSC’s support, the project is now developing. We’re getting close to securing some key partnerships with other organisations interested in prisoner welfare. 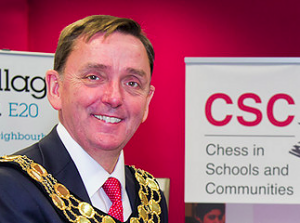 Since May, chess clubs have started in one more wing, and we’re hoping to team up with a local charity to open a free chess school for prisoner’s children. As with our chess programme in primary schools, the prison school’s numeracy course has weekly chess. Kajetan Wandowicz grew up in Poland and tried living in France, Cyprus and Spain before discovering that the food and the weather were much better in England. He lives with his fiancée in Bristol, where he teaches 16 CSC classes and a weekly library club.